A touch of California flair mixes with traditional St. Louis style in designer Steve Toedebusch's Clayton condo. When purchasing his condo in May 2014, Steve Toedebusch was surprised he chose the first-floor unit in the Clayton high rise. After years of living in the Central West End, the Clayton location was convenient, and the building, built in the mid-1970s, featured 9-foot ceilings, great security and its own dog park where he could take his dog Edie. Even better, the condo serves as a pied-a-terre between St. Louis and his residence in Palm Springs. “This place is so convenient because I can close the door and not worry when I am away,” Toedebusch says. Before moving in, he renovated the master suite and living areas to better suit his lifestyle and fit his design sense. French doors were added to the entrance to the living room to help minimize noise from the hallway. New lighting fixtures were selected, a simple silver trim was painted around the ceiling, and bleached-white flooring was added throughout the expansive living room. A large, open area, Toedebusch divided the living room into several smaller spaces that could function on their own while still being a part of the main room. Broken down into two seating areas, a dining space and a desk, the living room can serve as a backdrop for an intimate dinner party or a large cocktail party for 20. Painting the walls a cheerful, soft tangerine brings in a touch of California. Many of the furnishings found in the condo are a combination of pieces from Toedebusch’s previous St. Louis residence and his California place. 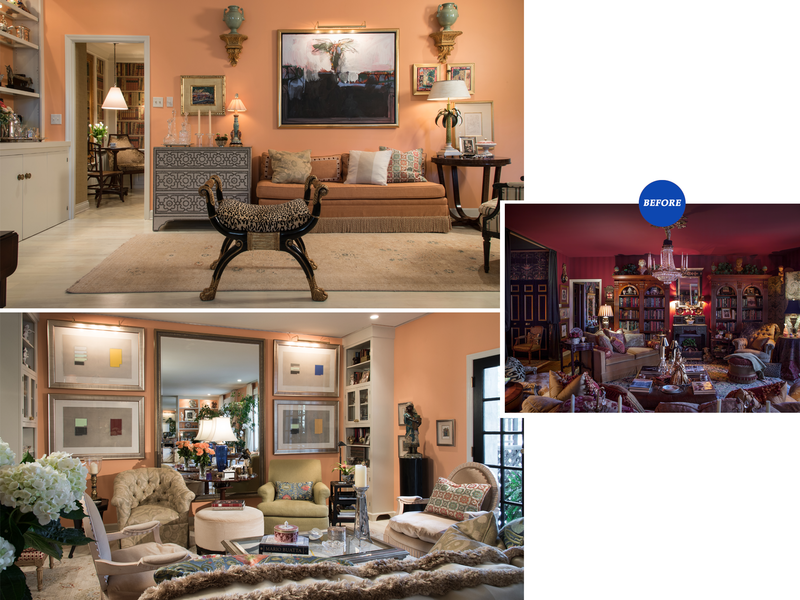 “I have been acquiring antiques, furnishings and artwork for more than 30 years,” he says. In the main seating area, two Donghia chairs are covered in a soft mohair fabric. A floor-to-ceiling mirror centered on the south wall reflects the opposing wall of mirrors and built-ins, which Toedebusch redid by adding white-wood shelves and updating the cabinetry. He added the custom built-in cabinets in the seating area to tie the spaces together and provide additional storage. Flanking the sides of the mirror are four paintings by artist Suzanne Caporael that Toedebusch previously had in his California residence. The contemporary pieces are a surprising complement to the traditional and antique furnishings throughout the condo. A quaint screened terrace is tucked just off the seating area. Intricate latticework provides both style and privacy when enjoying a cocktail or reading a book in the outdoor space. On the other side of the living room, a round dining table set for four can be expanded to seat up to 10. Guests can admire the Helen Frankenthaler piece, “Skyrider”, that hangs on the mirror. “With lots of wall space to fill, artwork played a big role in the design,” Toedebusch says. Much of the artwork in the condo was purchased at William Shearburn Gallery. Also on the north side of the living room is a second and smaller seating area, which includes a custom-made banquette created to specifically fit the space placed next to a Lucien Rollin Art Deco table. Most of the rugs in the condo are from Rugs by Saga, and a few even were selected before Toedebusch bought the place and knew where they would go. A stark contrast from the colorful living space, the master suite is neutral with black accents. Comfortable and soothing, Toedebusch used linen bedding and window treatments, as well as grasscloth on the walls. The headboard was custom made for the space. A Widdicomb étagère displays prized accessories. The location of the bathroom entrance was moved and space was taken from a walk-in closet to create a desk area and new bathroom entrance. 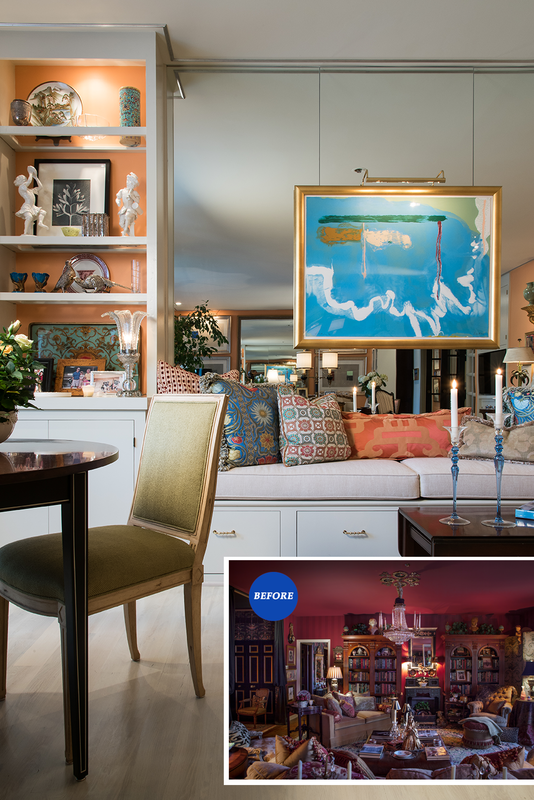 Whether hosting a group for dinner or spending a few weeks at home in St. Louis before taking off to California, Steve Toedebusch’s Clayton condo is a personal collection of unique pieces acquired throughout decades in the industry. Mixing a cool touch of California with traditional St. Louis design makes for one fabulous residence.